Lyndsie Lemerande, Linfield student, class of 2015, reading Vampire Diaries, by L. J. Smith, and Stefana Maxim, Linfield student, class of 2016, reading Wuthering Heights, by Emily Bronte. 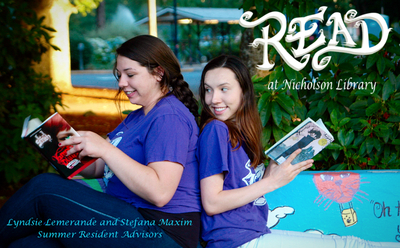 Terry, Paula and Nicholson Library Staff, "Lyndsie Lemerande and Stefana Maxim READ Poster" (2014). READ Poster Gallery. Image. Submission 139.